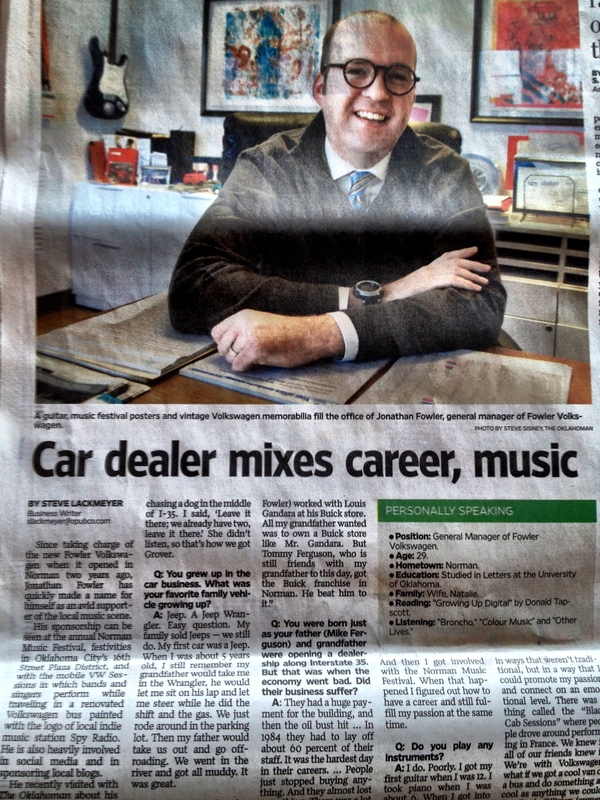 VDub Sessions producer and driver Jonathan Fowler had a Q&A in The Oklahoman this morning. Not only did it run as a full page in the business section but also it had a generous portion dedicated to the show. Check out what Fowler said about VDub Sessions in his interview after the jump. Q: What have been some of your favorite Fowler Volkswagen tie-ins to date? A: The VW Sessions is one I hugely enjoy. It’s something I’m doing with Mary Ann Osko and Nathan Poppe. Mary Ann Osko and I tried to find some ways to promote the store in ways that weren’t traditional, but in a way that I could promote my passion and connect on an emotional level. There was a thing called the “Black Cab Sessions” where people drove around performing in France. We knew it, all of our friends knew it. We’re with Volkswagen, what if we got a cool van or a bus and do something as cool as anything we could do? Ferris O’Brien (owner of Spy Radio) called, said there’s a bus I’d like to get. Would you like to help out? So we went and looked at it, and got the bus. And I knew Nathan Poppe from the Norman Music Festival, and I saw this kid with a camera all the time. So we got together. We got the top popped up, we drove around Lake Hefner and recorded the acts. A big congrats to Jonathan. His dedication to the Okie music scene is a big reason why the van keeps running.